Shaggy Woven Rug Is anything cozier than a Moroccan-style rug? We think not, especially when it's hand-woven with soft New Zealand wool. The Brooklyn based designer, Aelfie Oudghiri, took inspiration from weavings she found in the Atlas Mountains, merging modern graphic elements with traditional craftsmanship. The result? Good design that’s good for the world. Pine-scented Incense They say that smell is the strongest memory trigger. We remembered our favorite winter moments (snow-dusted woodsy walks; family ski trips) when we burned this subtle pine incense. Paine's Pinon Pine is made in Auburn, Maine with balsam branches cut by local woodsman. The wood is ground and dried without any chemicals added for a deep breath that will have you imagining yourself in the middle of a Pine Tree grove. Handmade Cozies These crocheted pieces warm both heads and hearts. Handmade in NYC by the shop's founder and no one else, each hat and scarf from DeBrosse has a very special giveback: 15% of every sale helps orphaned children in Haiti get access to school supplies, clothes and toys. 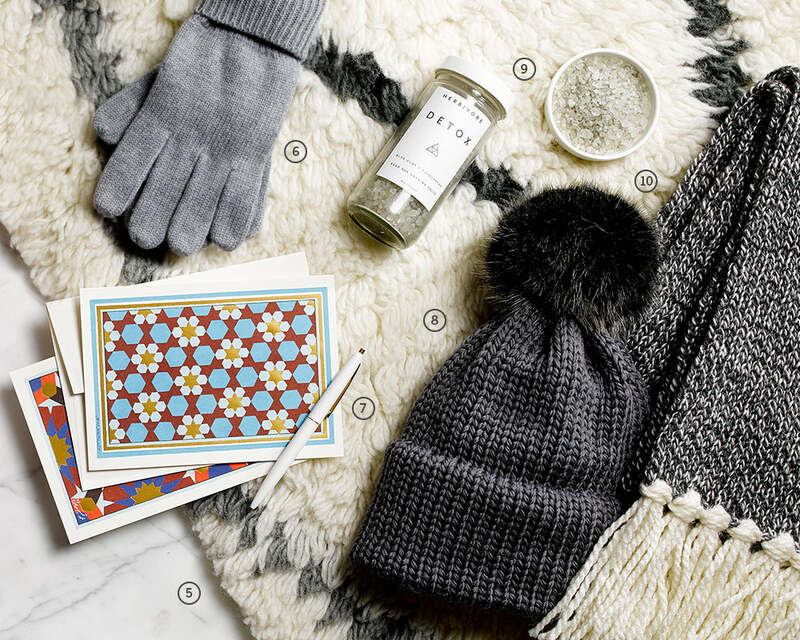 Artisan-designed Notecards Send warm thoughts with these special notecards. We love them for many reasons, not least of which is their intricate and mesmerizing designs, inspired by geometric patterns found in historic mosques and mausoleums across the world from Morocco to Malaysia. The artist grinds semi-precious stones to create richly luminous colors before the designs are printed by the Far & Wide Collective as note cards. Chunky Wool Yarn Cut the consumer out of conscious consumerism, and create your own warmth this winter. We think this oversized 100% Merino Wool yarn would make the prettiest beanie. Agree? Join us in taking this class. Detoxifying Bath Salts If you haven't jumped on the bath salt bandwagon yet, you just might after we tell you about these Dead Sea bath salts from Herbivore. Each all-natural, plant-based and organic ingredient is included for a therapeutic reason, resulting in a relaxing detox. Each small batch is made right here in the US (and is never tested on animals). 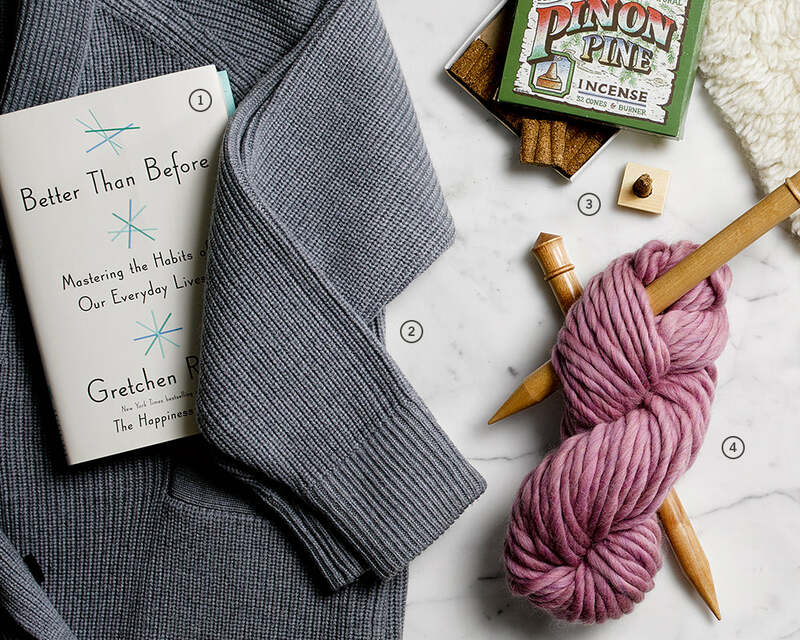 Wool Gloves and Sweater We love Everlane for its beautiful designs and commitment to transparency, so it's no surprise that several FEEDers’ winter wardrobes include these pretty gray basics. The gloves and sweater are made in a fair-trade factory in Dongguan, China that has a reputation for high employee retention (a great indicator of work environment). A Good Read Curl up with a cup of hot tea and this inspiring book from one of our favorite authors, Gretchen Rubin. It won’t long before you’re jumping into action. Better than Before had us thinking about the power our habits in new and profound ways that make positive change feel possible. Whether you're trying to get more sleep or stop checking your email so often, there's a game plan in here for all of us.